Detox is over but we are on week two of eating healthier. This week we are focusing on eating a "rainbow" of veggies and more whole grains. In regards to the whole grains I found a recipe for homemade multigrain English muffins. 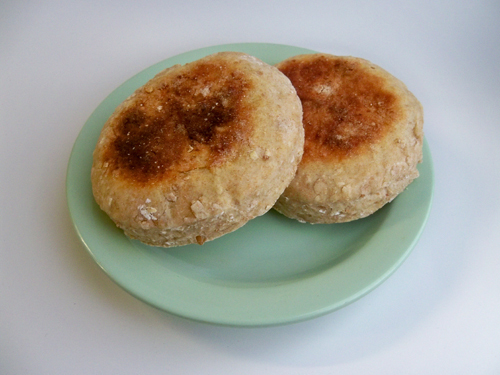 I never thought you could make your own English muffins but it wasn't too hard. They are not baked! You cook them on a griddle, 7 minutes on each side. That's how they get that toasted mark on each side. I was so surprised I could make muffins with "nooks and crannies"! and thank you soooo much for sharing them with me each morning - they are delicious! !